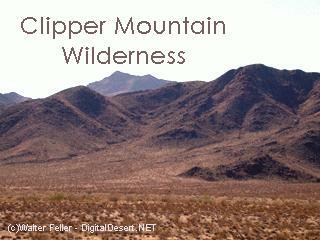 NATURAL RESOURCES: This wilderness encompasses a large mesa with surrounding canyons and hills to the southeast. Tracing the old World War II trail 7 miles up the northern slope of the Clipper Range may provide a glimpse of the bighorn sheep that reside within this wilderness. ACCESS: This wilderness is approximately 28 miles east of Ludlow, California and South of Interstate 40. Access the southern boundary from Route 66, east from the Ludlow to Danby Road. Go north 2.3 miles on this dirt road to the intersection of the Southern California Gas Pipeline, which forms the southern boundary of the wilderness. A high clearance vehicle is recommended. Parking is not permitted along the pipeline road right of way, therefore, you must be dropped off and picked up.